The biggest advantage of changing from cut to stamping is the cost efficiency. Since the processing time is significantly reduced as compared to that involved in cut processing, the cost can be likewise reduced. For example, consider a lot of 1000 parts. If the price is a few hundred yen with stamping, it might be a few thousand yen with cut processing. Even though the additional cost for die manufacturing is taken into consideration, if a certain amount of the production is estimated, the cost benefits are greater with stamping in many cases. Compared with the cut processing in which the material is cut one by one, the variations in the quality of the stamping, in which a large amount of material is processed at a time, is said to be less. 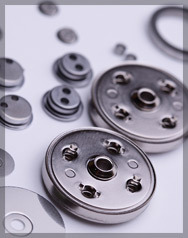 The consistency in the quality of components results in the consistency of quality of the products. We have introduced state-of-the-art instruments in our inspection department and have established a system for preventing defective components. The QA department analyzes quality both from the stamping and plating technology sides and guarantees the quality. The element analysis instrument has also been introduced to further meet the high quality requirements from the customers. Generally, it is believed that the cut processing has the higher processing precision; however, we here at Gotos have developed stamping technology that makes it possible to have the near-impossible processing precision in the stamping. Now, we can handle orders requiring micron levels of precision. At the same time, complex shapes can also be processed due to the innovations we've made in this technology. For example, where the holes of a thickness of 80-90% diameter are opened in conventional technologies, our company has achieved a hole of only 45% diameter. The components with complex shapes can also be processed using the 3-dimensional molding technology. The ability to pay the cost of manufacturing the die becomes the decision standard when opting for the stamping process. As the cost of manufacturing a die varies greatly based on factors such as the complexity of the components, it is difficult to generalize what is the minimum order quantity that will give you cost benefits in the stamping. However, if it is a relatively simple shape, you might get cost benefits in the stamping even if the order quantity is a few hundred. If you plan to repeat orders, even when each order is in small lots, you may reap cost benefits with the stamping. Upon your inquiry, we will offer price simulation. Our stamping can handle components of shapes which were generally considered impossible to achieve before. We can meet customer demands with our innovative expertise, based on our 3-dimensional molding technology. 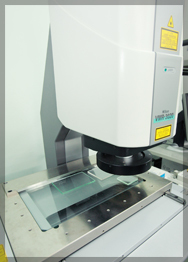 We also have the expertise to handle components with micron-unit precision. Generally, hard material is considered unsuitable for the stamping. However, we have technicians with deep knowledge in chemistry, and with their expertise, we co-develop new materials with customers. Even when stamping is not feasible due to component materials, there are cases where we can make stamping possible by developing alternative materials. Have you considered the possibility of going with stamping, but aren't sure what to do? Gotos, with its innovative technology, can provide various benefits to your company. Contact us and let us explain how we can be the answer to your molding needs.